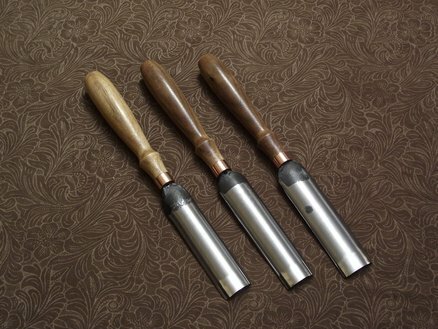 For the 2017 “Shop Made SURPRISE Tool Swap” I forged this set of three incanal wood carving gouges from 1080 steel. 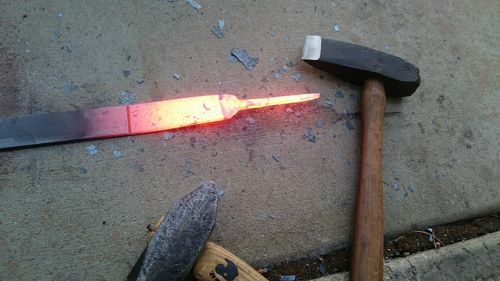 I forged the tangs then hammered the curvature with my swage block. I heat treated them in the forge, quenching in oil and tempering at 400 deg F, followed by softening the tangs. The handles are walnut (partially sapwood) with copper ferrules, finished with danish oil, shellac, and wax. They are three different sizes/sweeps, though it’s hard to tell from the photos. These are incanal since I have no way of grinding the concave flutes. Maybe someday I’ll get a small radius grinding setup and try making some outcanal gouges. 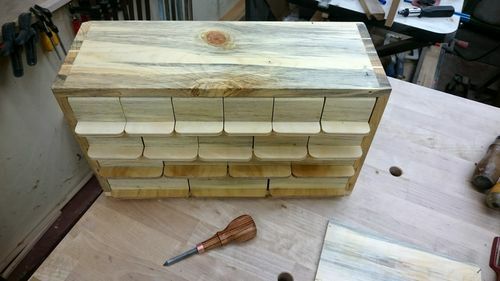 Bondo, thanks a lot for this amazing chest. I had no idea what I was looking at for a second when I first opened the package, then I was impressed when it clicked. 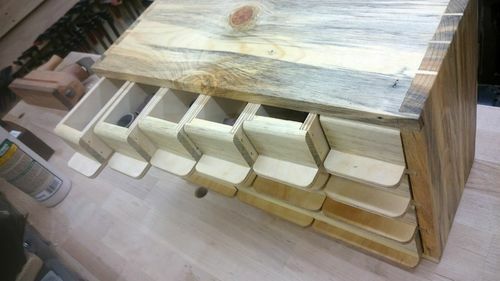 The blue pine is really beautiful, and the dovetails are nice. I’m keeping my rotary bits for the flex shaft grinder in it now. 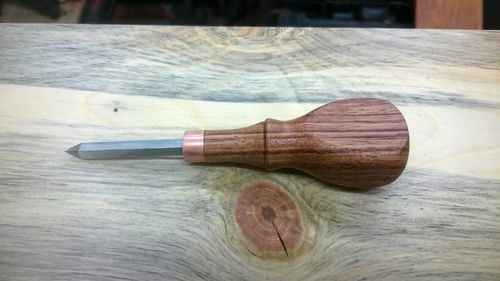 The birdcage awl is really impressive too, especially the hand-carved handle. I’m not sure what the wood and inlay materials are, but they’re both beautiful. You’re supposed to post this on the swap thread buddy. Well, at least Bondo’s item. I think you need to make a second set and ship them South. Amazing work Allen and one heck of a good skill set you’re developing there! You re supposed to post this on the swap thread buddy. Well, at least Bondo s item. I think you need to make a second set and ship them South. Posted it right after, hopefully all is well. I hope to make a full set someday for myself. Wish you could quit your day job and forge blanks for us all. Wow. I’d say that was a success! You both should be happy. I am impressed. Wow! 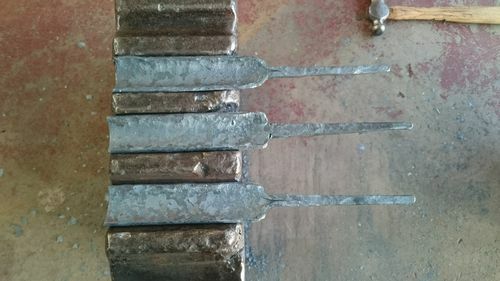 What wonderful set of shop made gouges. You have a fine set of skills to be able to forge and fabricate a set of tools like this. This post id fascinating. Great gifts from Bondo too! 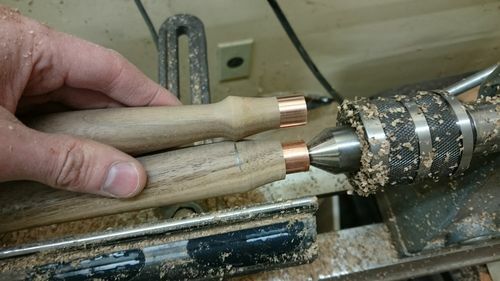 Nice chisels. 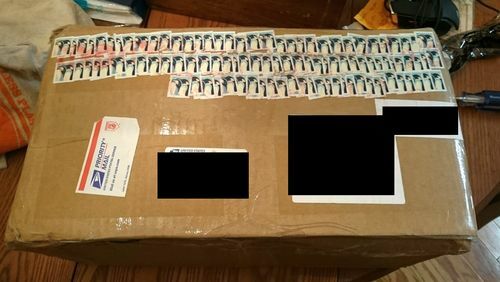 Thanks for the pictures showing how you did it. Neat swap. I think everything about these gouges are awesome. Another excellent project under your belt! Those are so cool, Allen! Love that you can incorporate the metal work with woodworking. 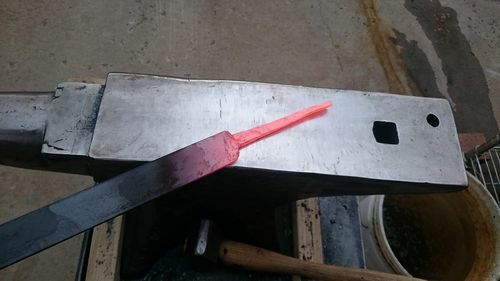 I struggle enough cutting and shaping metal, cannot imagine forging. That is amazing work. I tried my hand at forging last winter. It did NOT go as planned. This is lightyears beyond what I can do. Good on you for making something truly special! Way cool. Work in metal and wood! What could be better. Total badassery Allen. 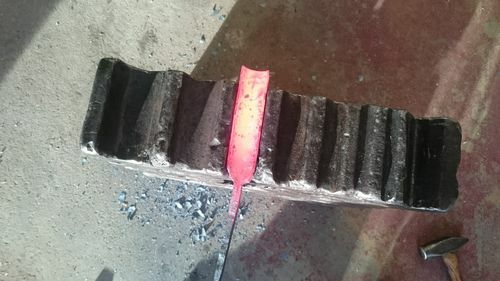 Love seeing the great tools coming out of that forge! Thanks friends. I definitely need a lot more practice with this whole forging thing, and some stronger arm muscles as I basically look like a twig. So I practice making all kinds of strange things. I’m looking forward to seeing more swap projects, I guess I jumped the gun posting this (itchy trigger finger). And Arcanum Unbounded Hardback – Bobasaurus – you and I would be great friends, I think! I’m hugely interested in blacksmithing and woodworking is a passion. I told my wife (as I took delivery of Brandon Sanderson’s latest hard cover book last night) that my next library goal is to get a hard cover signed edition of each of his books. Currently I only have all of them on kindle and audible, and a couple of signed leather bound versions (most recently Elantris with a Brandon-drawn Aon Rao inside!) lol.